Home / SkinCare / Trilogy Age-Proof Brilliantly Boosted Deluxe Celebration Set. Trilogy Age-Proof Brilliantly Boosted Deluxe Celebration Set. Tired and lacklustre skin can now be transformed, when applying the trilogy products that age-proof and boost your complexion. The limited edition trilogy age-proof brilliantly boosted deluxe celebration set, contains three highly popular and award-winning skin care products, for all skin types at any age. Trilogy use their latest innovation ingredient, Glycablend, to help keep the skin supple and healthy, while also stopping the process of glycation that causes deterioration of collagen fibres as we age. Inside The Trilogy Age-Proof Brilliantly Boosted Deluxe Celebration Set. 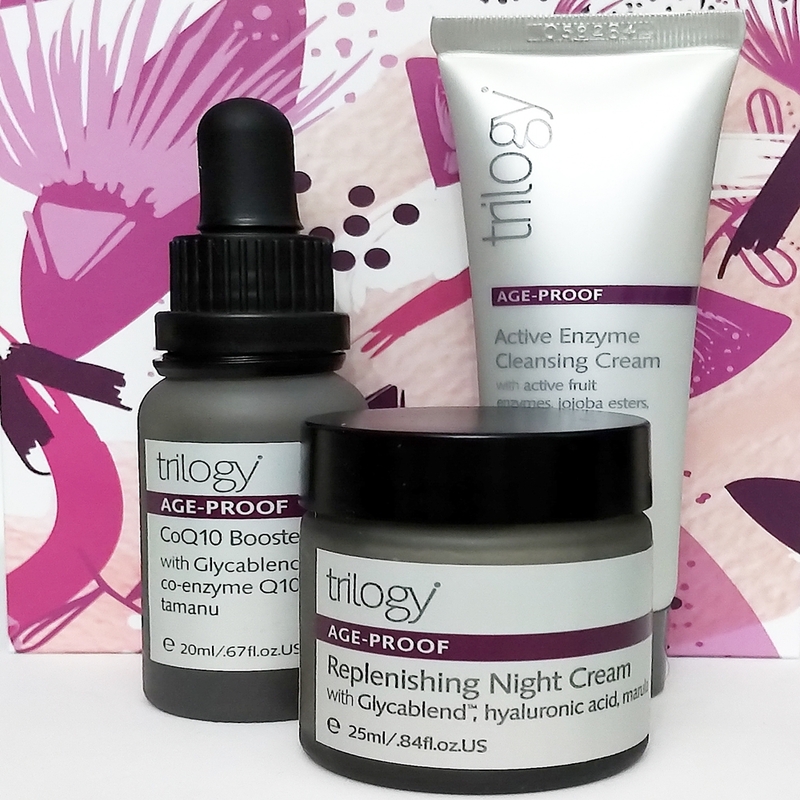 How To Use The Trilogy Age-Proof Active Enzyme Cream? The first skin care rule is to make sure your skin is clean and clear from any products that have been applied previously. The creamy cleanser removes all traces of makeup, while exfoliating and buffering away any dead skin cells, for a brighter complexion. The natural fruit enzymes are a great method to use, if your skin cannot tolerate scrubs containing beads or particles that manually buff away on top of your skin. The creamy consistency containing licorice and mulberry, brightens the complexion, while jojoba esters provide smoothness and softness to the skin. Massage onto face, neck and decolletage, before rinsing off with warm water, to experience clean and purified skin without feeling overly dry or taut. A great tip is to leave the cleanser on the skin for more than 3 three minutes to allow the enzymes longer to work, while also using a muslin cloth for a gentle but effective exfoliating experience. 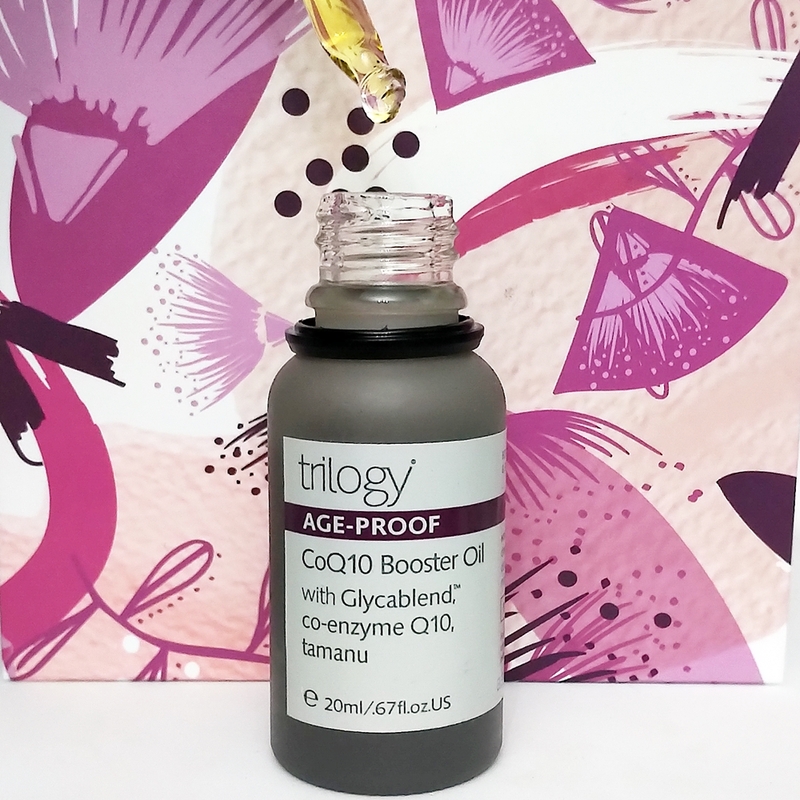 How To Use The CoQ10 Booster Oil? The booster oil recharges and revitalises the skin at a cellular level to boost collagen and elastin production, while also protecting the skin from free radical damage. The rich content from tamanu, macadamia and black caraway seed oils feed the skin, while CoQ10 acts as a strong antioxidant to protect and support. The added potent trilogy Glycablend consists of chia, blueberry, strawberry and pomegranate, to aid and maintain skins suppleness and youthfulness. Applying to a cleansed skin (Great To Use After The Enzyme Cleanser) massage 2-3 drops into face, neck and decolletage. The oil does have a runny consistency, which helps to spread the oil over the areas on application and you only need a little to use. It instantly absorbs to leave skin feeling super soft and hydrated, without leaving skin feeling greasy or looking shiny. A great tip, you can use your water serums before application, and if you use a water based moisturiser, you can apply the oil over it to seal these products into the skin. 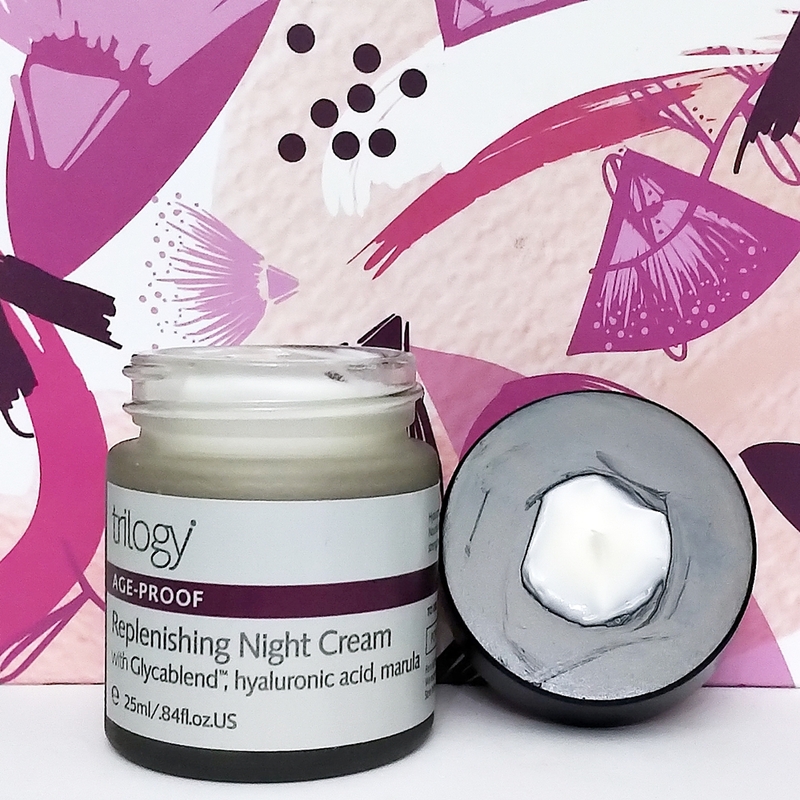 How To Use The Replenishing Night Cream? The replenishing night cream assists and supports skins natural regenerative process at night by supplying a potent blend of bio-actives. The deeply nourishing and repairing cream provides hyaluronic acid, marula, CoQ10 and the trilogy Glycablend to restore elasticity and suppleness, while smoothing fine lines and wrinkles. The light formulated cream glides over the skin easily and has a slight fragrance to enjoy, when applying at night. I was amazed on how quickly it absorbs into the skin, while leaving a soft and hydrated base that does not feel tacky or sticky. The next morning the complexion looks balanced, hydrated, and skin tone is improved, everything you want from a night cream! A great tip is you can apply your usual serums before application of the night cream and your favourite facial oil over top, if you wish. Why Use The Limited Edition Trilogy Age-Proof Brilliantly Boosted Deluxe Celebration Set? I have never used any trilogy products before, but i was so impressed with the products included in the gift set. The formulations are naturally effective and the application process is non-complicated and enjoyable every time i use them. The high-performance products complete a revitalising skin care routine to wake-up winter skin for that natural dewy glow or to rescue skin from damage the summer months can contribute to. The celebration set is a skin-loving introduction to trilogy skin care, pick up the age-proof brilliantly boosted deluxe celebration set for happy skin days, everyday!